Savor The Days: It's Christmas Time! Daddy and Nicholas went together to pick out our Christmas tree this year. They are quite a team because they picked out the most beautiful tree we've ever had. I have struggled this year with how to decorate. Last year I put away my traditional white lights for the tree and outside of the house. Instead I bought the multi-colored lights so that everything would be more colorful for the children. We did have a colorful house but I wasn't happy with it. I hated looking at all of the colors. It was just too much. So this year, I went back to the white lights and hoped the children would be just as excited. Of course, Nicholas noticed right away and complained that we didn't have the "rainbow" lights up. But he was still a good helper with decorating the tree. Our Elf, Chimney, came back to visit this year. He is from the North Pole and Santa sends him to check on Nicholas and Rachel. Each night he flies back to the North Pole to tell Santa if they have been good or report gift ideas to the elves. When he returns he finds a new place to sit for the day and then leaves again that night. We are not allowed to touch Chimney because he will lose his Christmas magic and not be able to fly back to see Santa. We can talk to Chimney but he is not allowed to talk to us. He first appeared on our Christmas tree (click on the picture to enlarge it and you'll see Chimney in the top of the tree). Nicholas found him quickly that morning and started telling him all about his Christmas wish list. 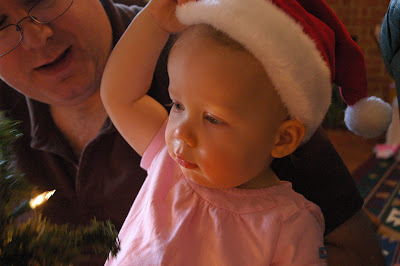 Daddy and Rachel worked on fixing some lights on our Christmas garland. Rachel loves all of the lights and colored ornaments and even the Santa hat! I love Christmas! I love being surrounded by lights, garland, the tree, little Santas and snowmen around the house, and Christmas music playing during dinner. But most of all I love the special time with family. The fun the four of us have together but also spending time with our parents, siblings, and their families. What a joyous time of year!